Yukon is one of three federal territories in Canada. 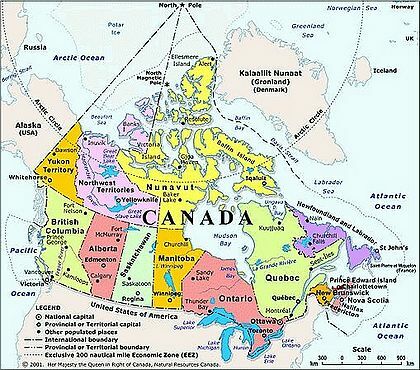 It is east of the American state of Alaska, north of British Columbia and west of the Northwest Territories. In 2002, its name was officially changed from Yukon Territory to just Yukon. In 1825 the Arctic Coastline of what would become Yukon was visited by the British explorer Sir John Franklin. The Klondike Gold rush commenced in August 1896 and The Yukon was declared a separate Territory in 1898 to better control the situation. Mining, and tourism remain economic mainstays; along with transfers from the federal government, now 40% of Yukoners work directly for one form of government or another. The capital is Whitehorse. The population of Yukon in 2016 was 35,874  only recently surpassing the total population of 1901. The territory encompasses 483,450 km2. in the extreme north west of Canada. ↑ Yukon Act, SC 2002, c 7. CanLII. Retrieved on May 26, 2017. ↑ Population and Dwelling Count Highlight Tables, 2016 Census. Retrieved on May 26, 2017. ↑ Readers Digest Atlas of Canada 1995, pg 52. This page was last modified on 19 September 2017, at 09:11.